2016 visit by Yuichi Danjo sensei of Osaka Dojo in Japan, and Scott Schnell sensei of Pinewoods Okinawan Karate in Iowa City. New members are welcome to join at any time. Please call or e-mail prior to your visit, so we know to expect you. Prospective students are encouraged to observe a class prior to joining. You are welcome to try a free class, provided a waiver of liability is signed prior to participation. If you plan on participating, please bring your own water bottle, as our facility is not equipped with drinking fountains. A waiver of liability must be signed prior to training. Dojo fees (outlined below) are due the first day of training after either an observed class or free trial. We accept children ages 12 and up. A waiver of liability must be signed by a parent or legal guardian, prior to training. Children may be evaluated for a period of up to 1-month to discern whether they are ready for karate training. Given that they are not evaluated as ready for this type of training, we will ask that they discontinue until a later time. All children must be accompanied by a parent or legal guardian, and parents or legal guardians are required to remain on the premises during training. $145.00 (non-refundable) includes (1) month dojo dues, (1) karate uniform, and processing fees. $35.00 annual membership to WMKA (World Matsubayashi-ryu Karatedo Association) – applies only to adult black belts. There are no fees for rank testing up to black belt. Shodan (1st level black belt) and above require various levels of processing fees for registration and certification with WMKA honbu dojo in Okinawa, Japan. We do not have contracts. Our basic fees go toward supporting overhead, and we do not profit off of karate instruction. Ravenswood Shorin-ryu Karate Dojo’s instructor maintains an unrelated day job. Discounted rates are available for Ravenswood Fellowship UMC members, Sansei Yonsei Athletic Association members, siblings, and single parents. Please e-mail us for more information. NOTE: We do not accept credit cards. Payment must be made either by cash or check. 2019 WMKA dojo license in good standing. 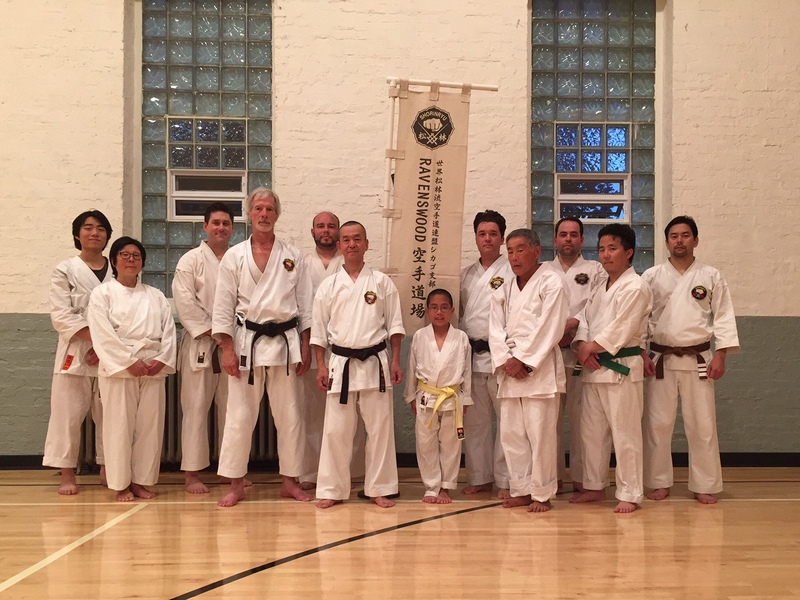 We wear a traditional karate “dogi” for training. However, beginners may take a trial class wearing comfortable clothing such as sweats and a t-shirt. Jewelry is not permitted on the floor during training. Women must wear a plain t-shirt under their gi top. We recommend having a physical and obtaining a doctor’s approval prior to training. Our classes may, at times, shift between anaerobic and aerobic, and we further recommend supplementing karate training with activity such as walking, running, or bicycling. We are not a competition-based dojo. Our practice of karate is as a budo (martial way) and cultural art form. We do not, however, discourage competition. Should the interest arise we may investigate local tournaments on behalf of the student, as a training tool. If, however, competition is your main interest in training, we can help direct you to other local karate dojo that are more competition-oriented. We practice out of the gymnasium of Ravenswood Fellowship United Methodist Church. Two unisex bathrooms are available for changing. RFUMC is not equipped with lockers, showers, or drinking fountains. Please bring a bottle of water to maintain hydration during practice. Erik Matsunaga (WMKA 4th Dan) began his martial arts training in 1989, and has been a student of Art Ishii Sensei (WMKA 6th Dan) since 1998. He is a licensed instructor of the World Matsubayashi-ryu (Shorin-ryu) Karatedo Association.